I first got into racing in 2005, sailing a Liberty at Travelling Trophy events across the Country against other Liberty sailors. My competitive nature came out, and I seemed to have a natural aptitude for it. 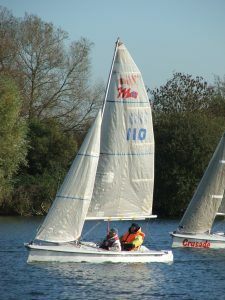 At this time a 2 person boat was being considered for the Paralympics. They had identified the Martin 16 as the likely choice, requiring a male and female team. One of the team had to have a minimal level of disability, whilst the other member had to have a classification of 1. Basically this meant no mobility and limited arm/hand function. I was very keen to get involved in this, and to be considered for Paralympic selection. Whitefriars were amazing and got 2 Martin 16s at the club. I could only helm the boat, and struggled to find a suitable female to crew the boat in the area. 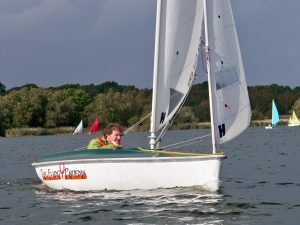 In 2006 the SKUD18 was chosen as the Paralympic 2 person boat for the 2008 games in China. The SKUD was too big for Whitefriars and required deeper water. A former GB coach had seen me sailing in competition, and was keen to get me to Rochester on Lake Ontario for the World Championships in 2017. Some how in the space of 3 months I managed to do fundraising to get myself, a crew, a carer, a coach, a borrowed SKUD18, and a RIB to the event. 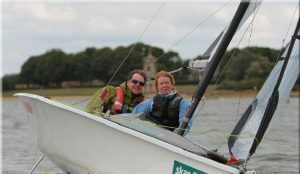 The coach found me a crew, Rachel Morris MBE, and we got to sail together once in a SKUD in no wind. Not ideal preparation. We actually finished 13th out of 18, which wasn’t too bad. I continued to train in a borrowed SKUD18 at Rutland and in Chesil alongside others on the GB development program. In 2009 I decided that I really needed a boat of my own, tailored to my needs. They cost £25k new, so I could only afford a second hand one. It had to be kept at Rutland, so I also bought my first Liberty, Flying Phoenix, because I could sail her more frequently and hone my sailing skills by sailing solo. I found a regular crew for the SKUD, Christine Spray, and we attended all the ranking and Sail for Gold events alongside all the Olympic sailors and hopefuls. Christine was new to sailing, and did incredibly well battling with all the control ropes. It was very difficult to be competitive in this type of boat because of we both had more limited function than the others, and the top sailors were fully funded; we were self funded. I learnt a lot during this time about racing and sail trim, but decided to sell my SKUD in 2012. The Liberty built by Hansa best suits my needs for sailing solo. My Liberty is still heavy but is much easier to rig and launch than a SKUD, and I can sail it locally at Whitefriars Sailing Club. All boats are given Portsmouth Yardstick (PY), which is like a golfing handicap for boats. This means that different boats can compete against each other fairly (arguably). I regularly race in the Club racing against the able bodied sailors, and often finish in the top 3. I frequently attend events up and down the Country to compete in fleet races against other Liberty sailors. These are open to anybody who wants to sail them, able-bodied or disabled. The fleet has been growing year on year, and it is now very competitive. I also travel to International events when possible. And that is the reason for this campaign – to raise money to go to the World Championships,October 2018, in Hiroshima.